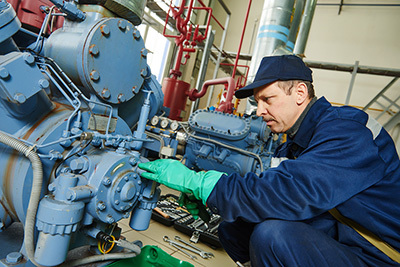 If you’re interested in working in industrial refrigeration after you’ve completed an HVAC program and are looking to enhance your credentials, consider certification from the Refrigerating Engineers and Technicians Association (RETA). Industrial refrigeration is used to cool items in large facilities like factories and warehouses. It differs from residential or commercial refrigeration because the equipment is larger (100 tons or more) and uses refrigerants such as ammonia and not used for direct consumption. Operating temperatures can also be much colder (-60°F to 55°F). Compare working in this environment to those of grocery stores and restaurants in commercial refrigeration and working as an HVAC service technician in a home or business. Founded in 1910, the Refrigerating Engineers and Technicians Association (RETA) is an international society of professionals and companies involved in the design, operation, and service of industrial refrigeration systems. 2 It is the most recognized organization in the U.S. dedicated to enhancing the professional development of industrial refrigeration operators and technicians. 3 As part of the organization’s professional development, they offer certification exams. What Types of RETA Certifications Are Available? Refrigeration Operator (CARO) and Certified Assistant Industrial Operator (CIRO). CARO – is an entry-level certification showing that an operator has demonstrated knowledge of industrial refrigeration on an exam and can work under supervision. No previous experience required. Depending on a particular job path an operator wishes to take, RETA offers some credentialing programs. For more information, you can check their web site http://reta.com/?page=certification. Why Would You Want RETA Certification? As in any industry, seeking certifications in addition to the education and experience you already have allows you to reinforce knowledge and skills and can make you more marketable when looking for a job. In fact, many HVAC/R employers prefer candidates who have certifications like HVAC Excellence or North American Technician Excellence (NATE) certifications could be beneficial for residential HVAC work. 4 , If you would like to go into industrial refrigeration, consider RETA certification. If you decide to seek any certification, here are some study tips to help you prepare for the exams. There are many industries where someone with solid HVAC training can work. While education and experience are necessary, getting certified in a particular specialty can give you that competitive advantage in getting a first job or advancing in your current one. For those choosing the industrial refrigeration field, consider getting a RETA certification.